This series came highly recommended to me by many parents. Before even reading a book from the well-liked Poppleton series I knew it was going to be good based on it’s influential author and illustrator team: Cynthia Rylant is the winner of a Newbery Medal for her novel Missing May (1993), Mark Teauge is a best-selling illustrator. What more could you ask for? 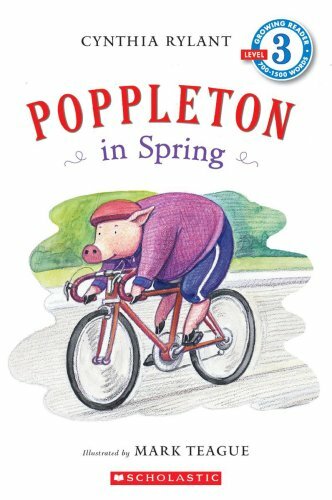 Poppleton in Spring contains three short stories perfect for the blossoming season: Spring Cleaning, The Bicycle, and The Tent. Using easy words and simple plots Cynthia Rylant manages to provide a character with a charismatic depth that children will appreciate. Each story about Poppleton contains its own good-humored antic which enables Mark Teague to deliver his illustrations and show us what a ‘funster’ he truly is. Very enjoyable!